A baby girl is reportedly being worshipped like a god in India after she was born with a facial deformity resembling an elephant's trunk. Villagers near Aligarh, Uttar Pradesh, have flocked to see the 'divine' girl in the belief she is an incarnation of the elephant-headed god Ganesha. They have continued despite doctors warning her condition may well be a genetic mutation, Asian News International reported. The newborn's aunt, named as Rajani, told the news agency: "My sister-in-law gave birth to a girl and her face looks exactly like Lord Ganesha. "Everybody is saying she is an incarnation of the god. "This is why whoever hears about her is coming here to get a glimpse of the baby and are making whatever offerings possible." The girl, who was reportedly born at 7am on Thursday, is said to be the fourth child in a so far ordinary and healthy family. Her facial lump is between her eyes and appears to have divided her nose in two when the girl was still in the womb. Doctors will examine the baby girl to find out the extent of her condition and whether they need to operate. They have warned the condition could be a genetic mutation triggered by malnutrition and increased pollution, ANI reported. A 2003 report by the environmental magazine Down to Earth said workers in Aligarh, an industrial zone, faced poor sewage works and 'nightmarish working conditions'. Ganesha is one of the best-known gods in Hinduism and is worshipped by millions as the deity of wisdom and intelligence. Last edited by sidsuae; 31-03-2015 at 07:46 PM. Bas yahi problem h India mein. Bimari aur jadu tona mei farak nhi kar paate kuch log. Tera mobile kharaab ho gaya hai bhai... har thread me shikayat kar raha hai tu..
Arrey nahin yaar...ye tikona ka Internet hai na....!...Abhi fone pe vodafone ka 3G chalaya tou image dikha.....wo doosre thread par bhi! An Indian teenager is worshipped as a god because he has a 7ins ‘tail’. Arshid Ali Khan, 13, has become a divine symbol in the state of Punjab. Locals have hailed him a reincarnation of the Hindu monkey god Hanuman - and refer to him as Balaji. However, Arshid has to use a wheelchair and he is considering having the ‘tail’ removed. He said: ‘This tail has been given to me by God. I am worshipped because I pray to god and the wishes of people come true. Arshid lives with his grandfather, Iqbal Qureshi, and two uncles, after his father died when he was four and his mother remarried. Mr Qureshi, a music instructor, said: ‘When he spoke for the first time at the age on one all he spoke was the names of Gods from different religions. Arshid's home has been converted into a temple where his devotees come to visit him to receive his blessings and touch his ‘tail’. ‘A lot of people’s wishes have come true after they have visited,’ claimed Mr Qureshi. However, Arshid often struggles to balance his time with his faithful devotees and attending school and playing with his friends. Despite his supposed powers, Arshid has to use a wheelchair and suffers from an undiagnosed disorder. 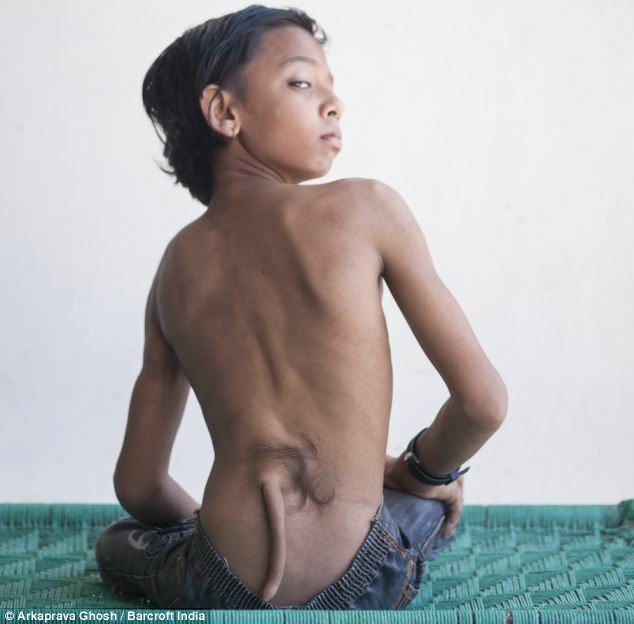 Some doctors in India have told the family it is down to brittle bones while others have said it is due to the 'tail' growth protruding from his spine. Others have suggested he has a form of spina bifida called meningocele. This develops when membranes poke through a hole between the vertebrae, and it can lead to partial paralysis. This month he is due to see a doctor who has said he can successfully remove the appendage - but his family are sceptical and say they would rather he kept his tail than undertake a risky operation. But Mr Qureshi said: ‘It is for Balaji to decide. If he wants to get the tail removed, we do not mind. As for Arshid, he does not believe the removal of the tail will stop the crowds flocking to his house for blessings. again its surprisngly funny when people have freedom of expression (shunting garbage too) and freedom worship .......why people questioning "Who people are worshiping"
their faith...their life!...exactly, so why do you have a problem with muslim traditions!?.... split-personality disorder...? that's where you are wrong. Islamic ideology has been followed by saints..leaders...army commanders....scientists...artists....and many a great men. Ab agar ISIS aur alqaeda ko Islamic ideology samajhte ho, tou ye tumhara fault hai. Islam ka nahin. So hardly matters how many saints endorses such anti-child, anti-woman ideology .....need to correct it !! girl child.....polygamy...dowry...bride-killing...female infanticide....and thousand other evils were present in india society before Islam, and they are still prevalent today too. blame your own roots for it. Baby Girl Born With Two Faces and Four Eyes!! !!! Baby Girl Born With Two Faces and Four Eyes,Worshipped as a God !! !